I'm in the process of building my first custom printer and chose the Duet Maestro as my motherboard. So far, I love it! I also decided to implement bed-leveling and went with the BLTouch. Upon receiving my sensor from Amazon, I noticed it was the new V3, which had no information or manual at the time. I requested a manual from AntClabs, which they posted here for us. Due to unclear terms and my poor electronics knowledge though, I mostly installed it by trial and error, so I'm writing this post to tell how I installed my V3 and also include some pictures from my O'Scope of it's signal timing. First, the basic procedure for wiring the V3 is similar to older versions. You can learn how in the wiki here. After following these instructions, it worked perfectly the first try. (without smoke!) I simply ignored cutting the trace for 3V because mine didn't have one. I've noticed a lot of confusion on this new version, and was still curious about the "Logic-free Mode," so I decided to investigate! As a full disclaimer, this is my first experience with a BLTouch, and is based on my experience only. I am not liable for burnt boards! As you can see, the signal peaks at just over 1V, which should be safe for the Duet. Next, I sent a "M280 P64 S140" to put the sensor into "5V Logic ZMin" mode. Here are the results when probing again. All of these tests were done with the BLTouch powered with the 5V, GND, and the MOD pins from the Z-probe pins on the Maestro. Hopefully this helps someone! My experience has been fairly smooth, and I now love my BLTouch! Feel free to ask any questions you might have, and I can supply pictures of the V3.0 if somebody needs them. Thanks for all the valuable information and time thats given here, and I hope this can help give some of it back! @dc42 It would be great if you could verify my statements about the Maestro in this post. Thanks! @JadonM, thanks for doing these tests and publishing the results. Based on your results, I recommend using the 5V logic Zmin mode because it provides the cleanest signal. The Z probe input on the Duet Maestro (and on Duet WiFi/Ethernet rev 1.04) can tolerate up to 30V. the signal peaks at just over 1V, which should be safe for the Duet. which only you can verify. I recommend using the 5V logic Zmin mode because it provides the cleanest signal. The Z probe input on the Duet Maestro (and on Duet WiFi/Ethernet rev 1.04) can tolerate up to 30V. Would the 5V Logic Zmin mode also be best for Duet boards older than v1.04? no board older than 1.04 can not tolerate 5v on the zmin. More precisely: we can't guarantee that older boards will tolerate 5V, because that relies on the ESD protection diode within the MCU to limit the voltage, and although this works the MCU on the Duet doesn't have a rating for pin injection current. At 5V input, the injection current would be about 120uA. In logic free mode, the BLTOUCH have a open drain output, so you must add a pull-up resistor connected between the output and the 3.3V. Try with a 4.7Ko or 10Ko. if the duet works best with 5v logic and the ramps boards also need 5v, what is the point of the new default? The Duet is 3.3V input, but the input allow up to 30V for input because internal diodes clamp to 3.3V. But it's more clean to output 3.3V signal from the BLtouch I think, because it's the native voltage. Just add a pull-up resistor to 3.3V. The first waveform seems to have ac coupling. I presume that the oscilloscope was set to DC coupling. All the measurements were done with DC coupling. I'm thinking the weird waveform might be the result of no pull-up resistor, as referred to by @pipersw. I've done some more measurements, this time with the BLTouch's output connected to the board and o'scope. Before I had it connected to the o'scope alone. This yielded much different results. Does the Duet Maestro have a built-in pull-up resistor? Above is with the output connected to the board in "Logic Free" mode. This waveform looks much more sensible and is at around 3V, not the previous 1V when it was unconnected. This is with the BLTouch in the 5V Logic Mode, but to my suprise, it seems to only show about 3V. Is that because of the clamping diodes, @pipersw? Does the Duet Maestro have a built-in pull-up resistor? The Z probe input of the Maestro has an internal pull up resistor inside the microcontroller, value about 100K. I am fairly sure that it is enabled when you select BLTouch probe mode, but I will check. 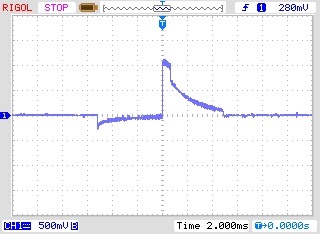 @jadonm Yes, it's the clamping diode whose stuck at 3.3V. On schematic of Maestro, there is a external 10k pull-up, so the internal pull-up of the processor is don't care if enabled or not, because it's around 10k in all case. 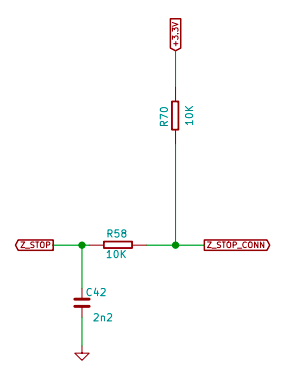 If you mean R62, that's a 10K series resistor, not a pullup resistor. I have confirmed that the internal pullup resistor is enabled when BLTouch mode is selected. @dc42 No, if I take the picture , I mean R70. That's the Z endstop connector, not the Z probe connector.